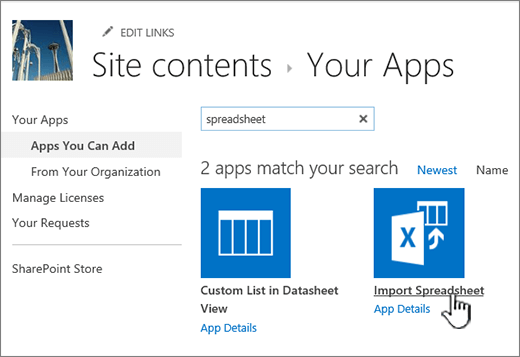 You can save time when you create a SharePoint list by importing an existing spreadsheet file. When you create a list from a spreadsheet, its headings become columns in the list, and the rest of the data is imported as list items. Importing a spreadsheet is also a way to create a list without the default Title column. Use a 32-bit version of Internet Explorer 10 or 11 to import a spreadsheet. Importing a spreadsheet relies on ActiveX. Once the list is imported, you can then work with the list in any SharePoint supported browser. Another method of moving data into SharePoint is to export a table directly from Excel. For more info, see Export an Excel table to SharePoint. Important: If you get an error message stating that a valid spreadsheet you're importing isn't valid or contains no data, add the SharePoint site you're on to the trusted sites list on the Security tab in Internet Explorer Internet Options. Updated April 25, 2017, thanks to customer feedback. On the site where you want to add a spreadsheet based list, go to Settings and then click Add an app. In the Find an app field, type spreadsheet and then click the search icon . In the search results page, click Import Spreadsheet. In the New app page, type a Name for the list. The description appears underneath the name in most views. You can change the description for a list at any time using list settings. Browse to or type the File location of the spreadsheet. Click Import when done. 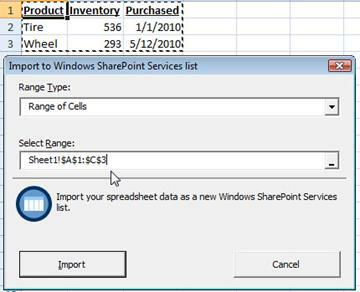 The spreadsheet will open in Excel, and you'll see the Import to Windows SharePoint Services List window. In the Import to Windows SharePoint Services List window, choose Table Range, Range of Cells, or Named Range. If you want to select a range manually, choose Range of Cells, and then click Select Range. In the spreadsheet, click the upper left cell, hold down the Shift key, and select the lower right cell of the range you want. The range will appear in the Select Range field. Click Import. After you import a spreadsheet, check the columns of the list to make sure that the data was imported as you expected. For example, you may want to specify that a column contains currency instead of a number. To view or change list settings, open the list, click the List tab or click Settings , and then click List Settings. The spreadsheet data will appear in a list in SharePoint. 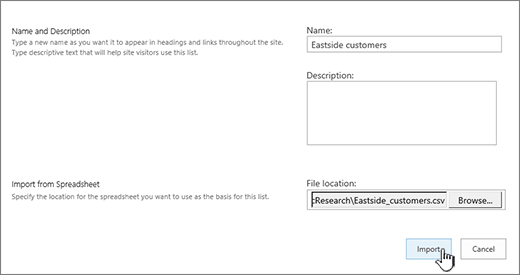 In SharePoint 2010, under All Categories, click Blanks & Custom, click Import Spreadsheet, and then click Create. 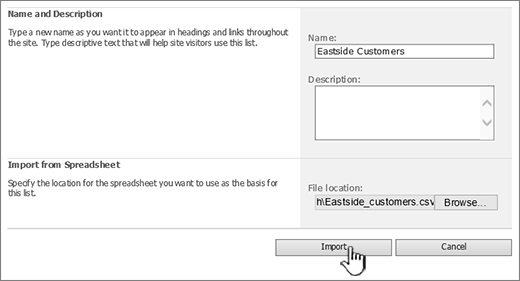 In SharePoint 2007, under Custom Lists, click Import Spreadsheet, and then click Create. The name appears at the top of the list in most views, becomes part of the web address for the list page and appears in site navigation to help users find the list. You can change the name of a list at any time, but the web address will remain the same. The description appears underneath the name in most views. You can change the description for a list. Browse or type the File Location of the spreadsheet that you want to import and then click Import. 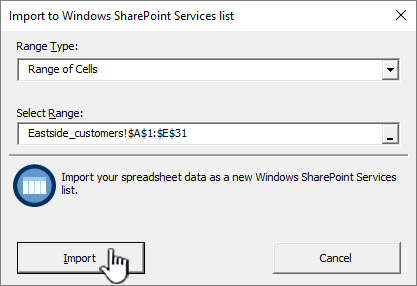 In the Import to Windows SharePoint Services list dialog, select the Range Type, in Select Range specify the range in the spreadsheet that you want to use to create your list. Note: Depending on your spreadsheet program, you may be able to select the range of cells that you want directly in the spreadsheet. A table range and a named range must already be defined in the spreadsheet to be able to select it in the Import to Windows SharePoint Services list dialog. After you import a spreadsheet, check the columns of the list to make sure that the data was imported as you expected. For example, you may want to specify that a column contains currency instead of a number. To view or change list settings, open the list, click the List tab or click Settings, and then click List Settings. 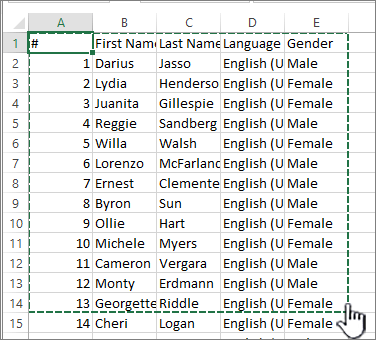 The types of columns that are created for a list are based on the kinds of data that are in the columns of the spreadsheet. For example, a column in the spreadsheet that contains dates will typically be a date column in the SharePoint list. The following image is the SharePoint list that was created by importing the spreadsheet in the previous image. All versions of SharePoint let you import a spreadsheet of data, though how you do it varies slightly between the versions. Examples here use Excel, but another compatible spreadsheet would work. If your spreadsheet program's native file format isn't supported, export your data to a comma delimited format (.CSV) and import using that file. For links to topics on how to customize and add your imported list to a page or site see, Introduction to lists. 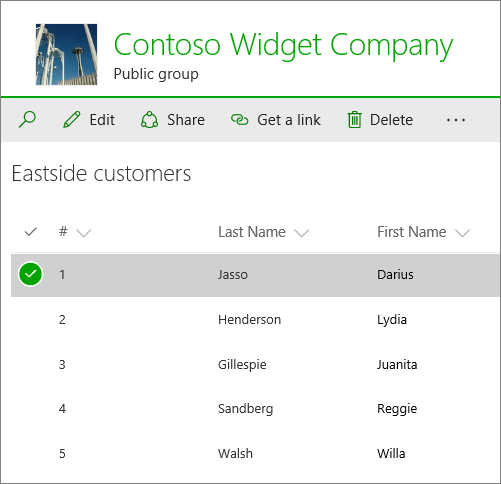 Note: Typically, the columns are set up on the SharePoint site based on the type of data that they contain. After you import a list, however, you should inspect the columns and data to make sure that everything was imported as you expected. For example, you may want to specify that a column contains currency rather than just a number. To view or change the list settings, open the list, and then click List Settings on the Settings menu. Select the Security tab, click Trusted sites, and then click Sites. The site you're on should appear in the Add this website to the zone: field, click Add.